"The consultative meeting of the Southern African Development Community (Sadc) Heads of State and Government, held on February 9, 2019, received a briefing from His Excellency, Mr Mnangagwa, and President of the Republic of Zimbabwe on the current political and socio-economic developments in the country," said Dr Geingob. "The Sadc Heads of State and Government noted that since coming into power, the new Government of Zimbabwe has continued with concerted efforts to address socio-economic challenges and transform the economy, particularly through the Zimbabwe Transitional Stabilisation Programme (2018-2020), and to consolidate unity and peace in the country." He added, "This, notwithstanding, some internal groups, in particular NGOs, supported by external forces, have continued to destabilise the country." 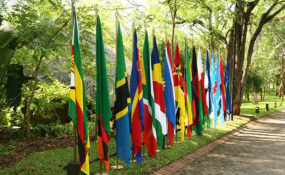 "Sadc condemns in the strongest terms, the violence that ensued and expresses sympathy with the affected families for the loss of their loved ones and their properties. "The Sadc Heads of State and Government further noted that the Government's efforts to transform the economy and bring prosperity to the people of Zimbabwe are negatively affected by the illegal sanctions that were imposed on the country since early 2000."